The pieces all came together Wednesday night as the Jackets topped the sixth ranked Miami Hurricanes 71-69 in Coral Gables. The win was Tech’s first victory over a ranked team since March 2010, and was also Coach Brian Gregory’s first win over such an opponent at Tech. It also guaranteed the Jackets a season record of above .500, a vast improvement on last season’s 11-20 standing. A majority of the first half demonstrated the usual parity that ACC fans have come to expect from the conference. After quickly falling behind 7-2, the Jackets responded by spreading the scoring around and putting together a 10-2 run. Senior guard Mfon Udofia and freshman guard Chris Bolden made back-to-back threes to give Tech its first lead of the night. The Jackets, however, soon found themselves trailing 25-14 just 10 minutes into the first half. During Miami’s 16-2 run, Tech committed three fouls, two turnovers and shot only 1-5 from the floor. For a moment, it appeared as though the Jackets were indeed outmatched. …where it fell through the cylinder at the buzzer, giving the Jackets the 71-69 victory. But a dunk by redshirt-junior center Daniel Miller cut the lead to single digits, and the Jackets were able to hang with the heavily-favored Hurricanes for the rest of the first half, matching Miami punch for punch. After a pull-up jumper on a fast break by freshman guard Solomon Poole and a jumper by Miller, the Jackets headed into the locker room with a score of 43-32 in favor of Miami. Bolden started off the second half red-hot, despite his freshman status by making plays all over the court. Bolden scored eight of Tech’s first 13 points in the second half, hitting from both in the paint and from long distance. His teammates followed suit, as freshman forward Robert Carter, Jr. and redshirt-junior guard Brandon Reed both began shooting accurately from behind the arc. The three sharpshooters went 5-6 from long range in the first 10 minutes of the second half. Just like that, the Jackets were within four and the Hurricanes appeared rattled. With a score of 60-56, Miami took a timeout to regain its composure. Redshirt-junior forward Kammeon Holsey gave the Hurricanes no such chance as he cut the lead to two with a layup just 12 seconds later at the nine minute mark. Tech battled through adversity much like it has in many other games this season, but this game was different. After failing to close the gap several times, Bolden tied the game at 65 with a three pointer from in front of the Tech bench with just five minutes to go. A minute later, Bolden slashed through the lane, tricked the Miami defense with a well-executed ball fake, and gently placed the ball in the basket, giving the Jackets their first lead since early in the first half, 67- 66. Just under four minutes remained on the clock. With one minute of play remaining, the game was locked in a 69-69 tie, with Miami in possession. Carter, Jr. intercepted a pass in the paint moments later, and sure enough, the Jackets were poised to knock off the sixth-ranked team in the nation. Freshman guard Marcus Georges-Hunt, who had been quiet for most of the night, found the ball in his hands on that final possession, despite having gone 1-5 from the floor in the game. Hunt drove the lane, pulled up, and released a shot that rattled off of the back of the iron into the air. Through a mass of reaching arms, Hunt managed to grab the offensive rebound and tip the ball back towards the basket, where it fell through the cylinder at the buzzer, giving the Jackets the 71-69 victory. Tech was the first team all season to beat the Miami Hurricanes on their home court. 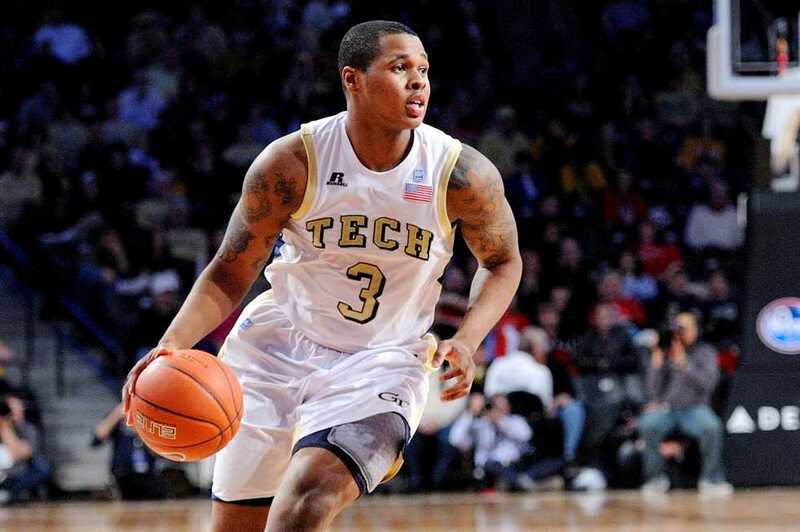 Tech also prevented the Hurricanes from winning the ACC regular season title outright with the victory.